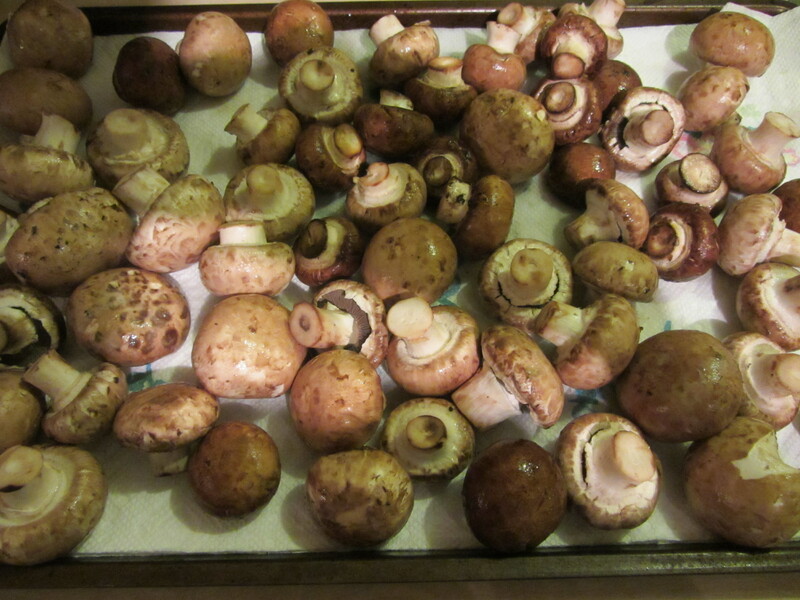 When I was a kid, my family used to head out in the woods to go mushrooming. My parents had taken classes on the subject and had a variety of books. If we happened to find any questionable fungi, my parents would ask an expert before we would eat them. My parents swore that my brother and I were better at finding mushrooms than they were, which my dad attributed to us being “closer to the ground.” Who needs a mushroom-smelling hog when you’ve got little kids? My mom once caught me eating small brown mushrooms in our front yard when I was little. Shortly after I ate the mushrooms, I became very sick. It turned out that the mushrooms were not poisonous, and I just had coincidentally contracted some sort of bug. It makes for a good story now, but it wasn’t so funny at the time. I really like mushrooms and we eat them fairly regularly, though we don’t tend to purchase the more exotic varieties very often. 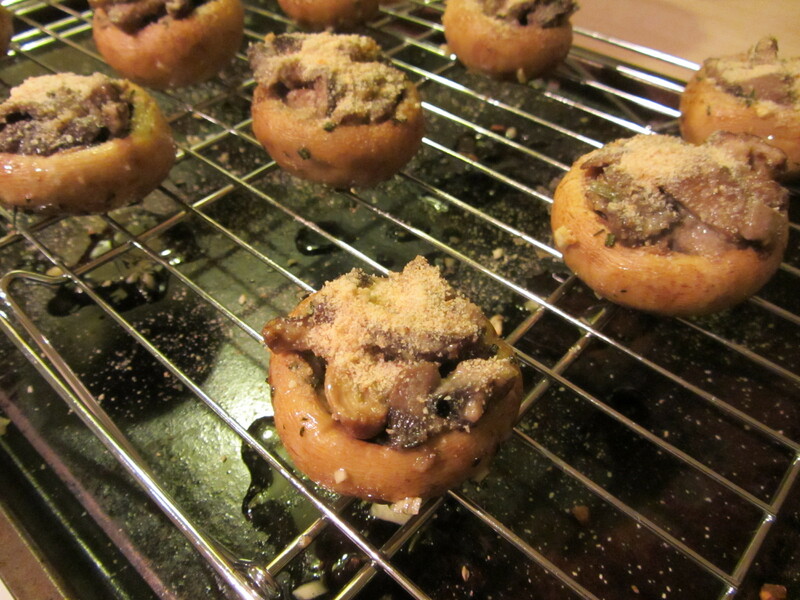 We usually stick to the creminis, portobellos, and the occasional shiitakes. A family friend taught me a recipe for sauteed mushrooms when I was a teenager, and it became one of the things I cooked regularly for our family dinners. I was curious to see how Alton’s recipe for sauteed mushrooms would compare to the one I’ve been making for nearly 20 (yikes!) years now. The first part of this recipe is actually a recipe within the recipe, as you first need to make clarified butter. 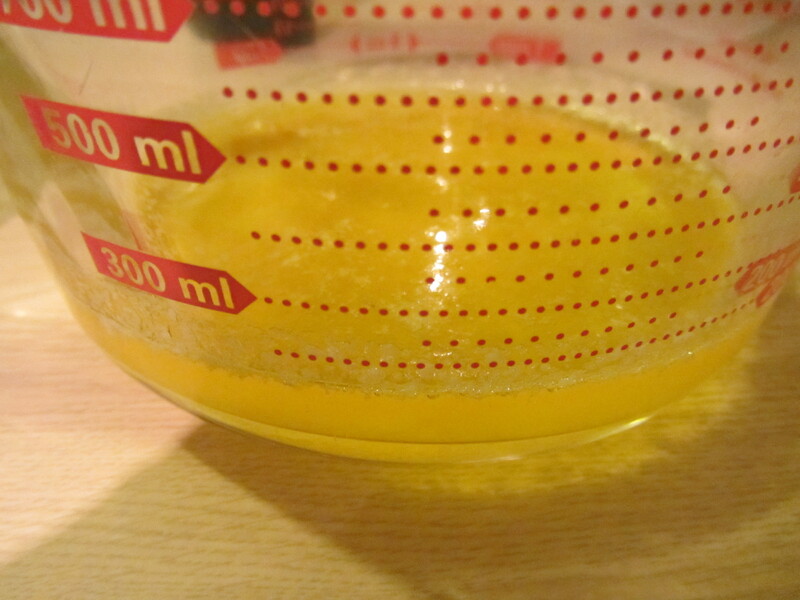 I had never made clarified butter before, though I knew the basics of how to do it (it’s very simple). My dad used to make it on a regular basis. 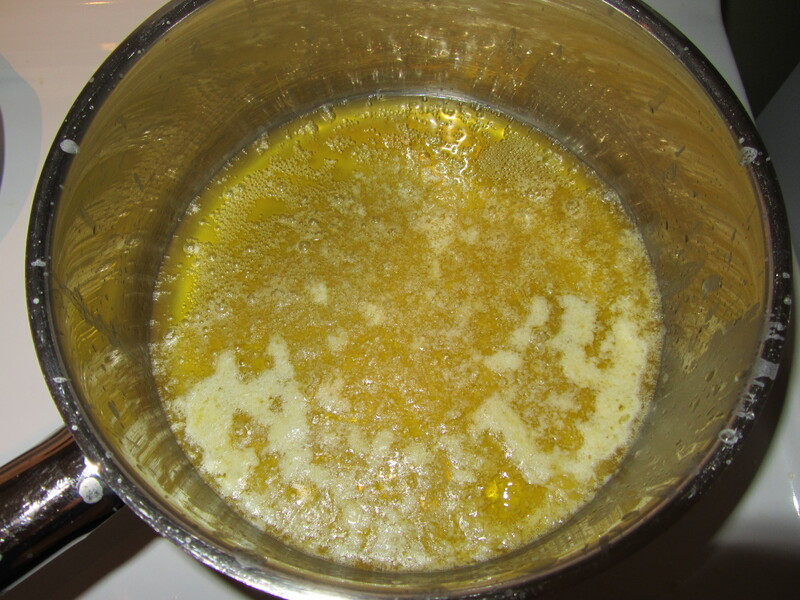 To make clarified butter, Alton explains that you simply melt your butter over low heat, continuing to cook it until it stops bubbling and the liquid is clear. This takes approximately a half hour. Butter mid-way through the clarifying process. 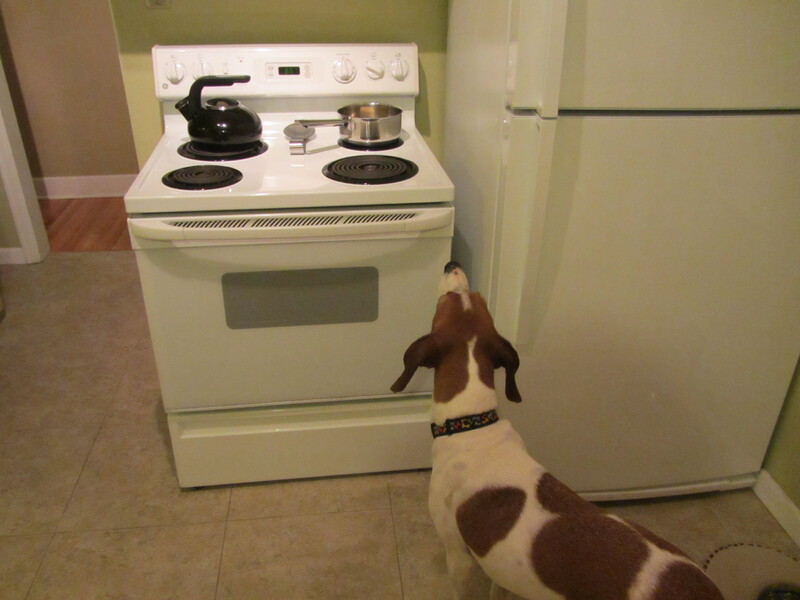 Clarifying butter = a half hour of torture for a hound dog. Butter, still bubbling as it clarifies. Once cool, you strain the butter for immediate use. Or, to use later, you top the hot butter with a couple inches of hot water, and allow the liquid to cool in the refrigerator. 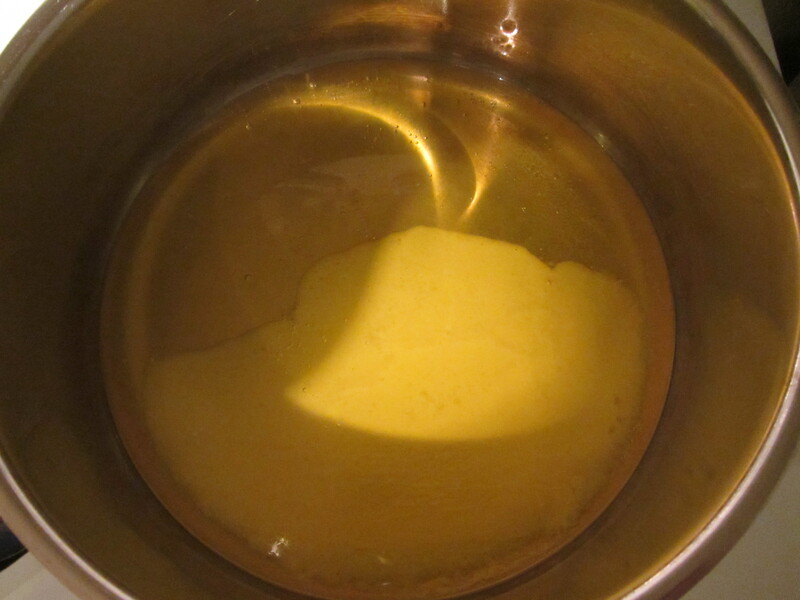 The clarified butter will solidify into a solid puck. I began the butter process while I prepped my ‘shrooms. 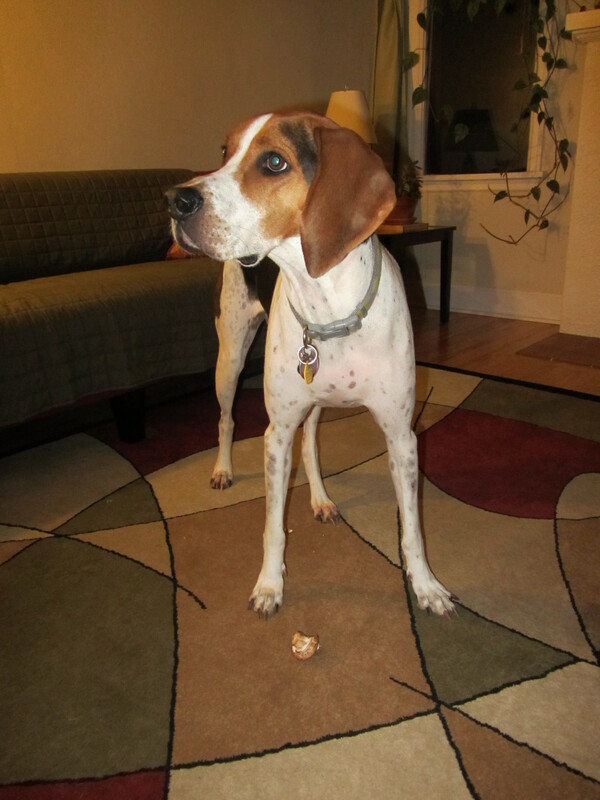 Apparently, there actually is something a Coonhound will not eat. Alton suggests cleaning your mushrooms if they have any visible dirt. To clean them, he says it is easiest and best to simply give them a good rinse in a colander, drain them, and roll them in paper towels. 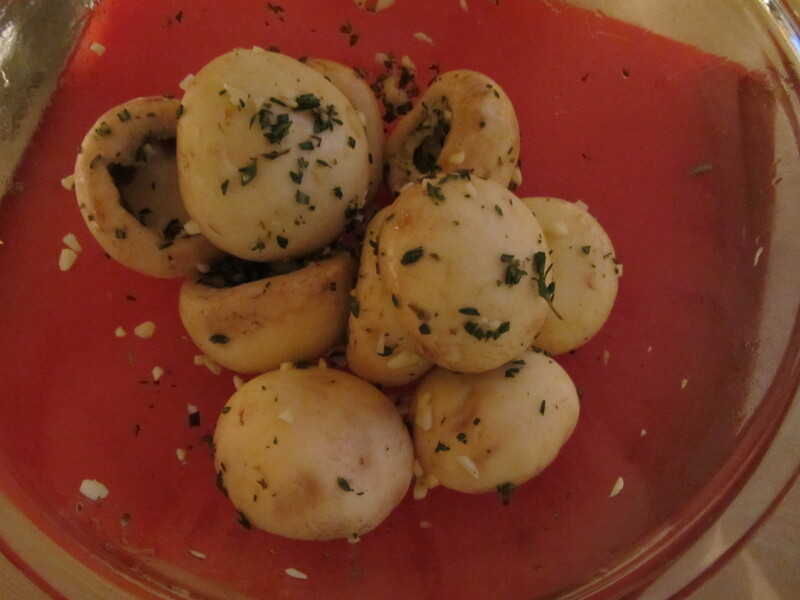 Cremini mushrooms, ready to be rinsed. Other mushroom tips from Alton: 1) Store mushrooms in a paper bag. 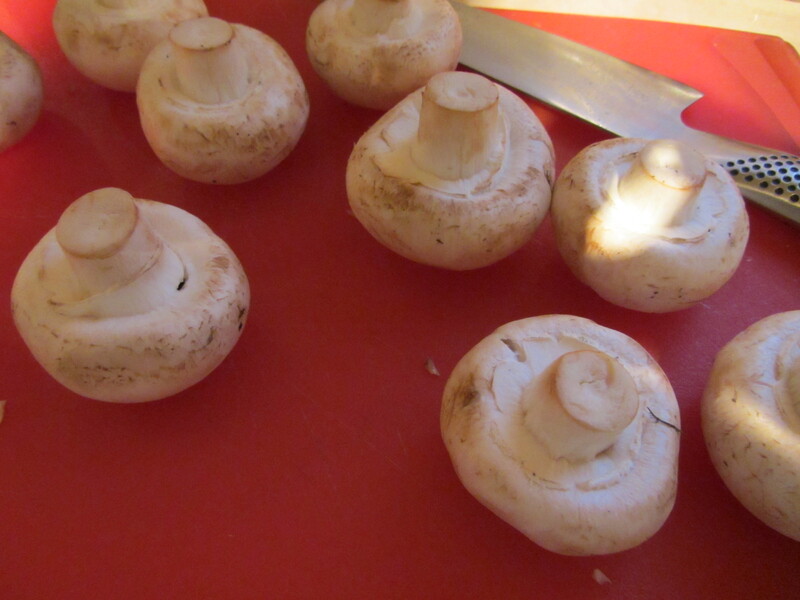 2) Treat mushrooms like they are meat, using hot, fast, and dry cooking methods. 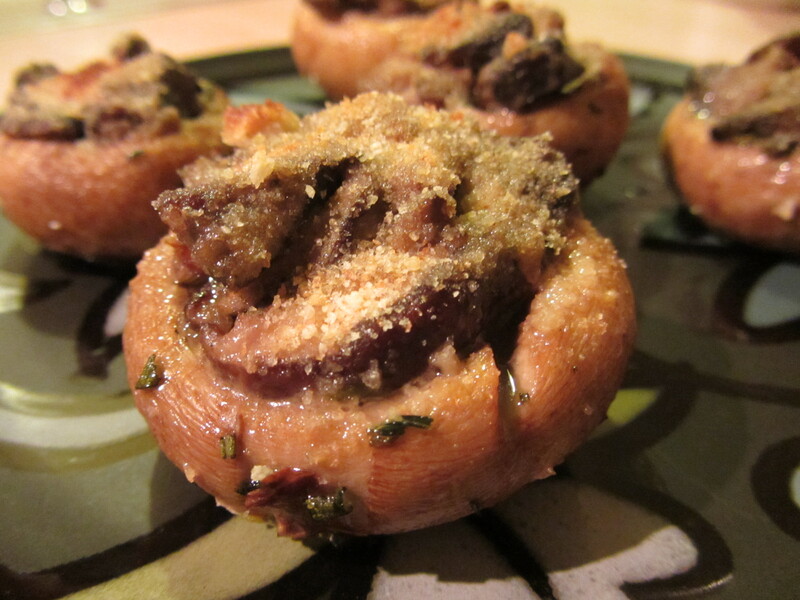 For this particular recipe, you use cremini mushrooms. 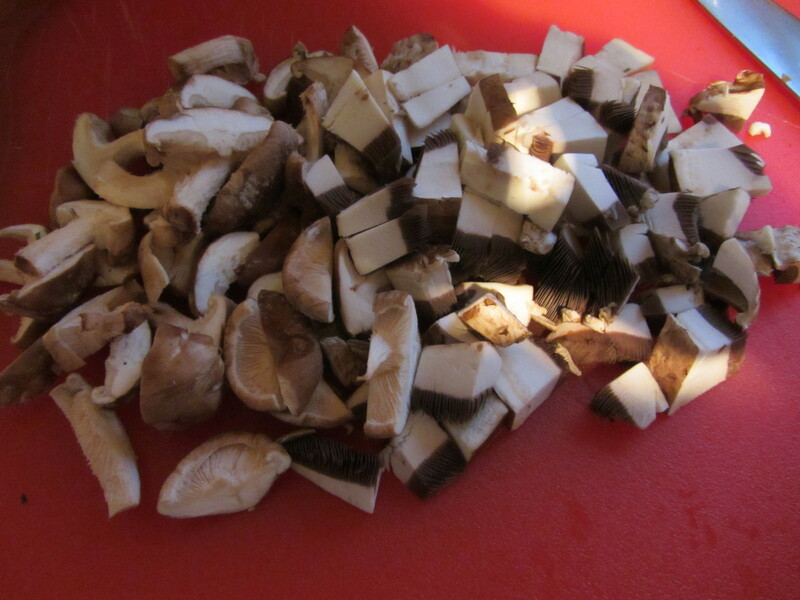 I washed my mushrooms and sliced them into 1/4″ slices. Apparently, an egg slicer works perfectly for slicing mushrooms, but we do not have one, so I did mine with a good ol’ knife. All of the ingredients for the saute. 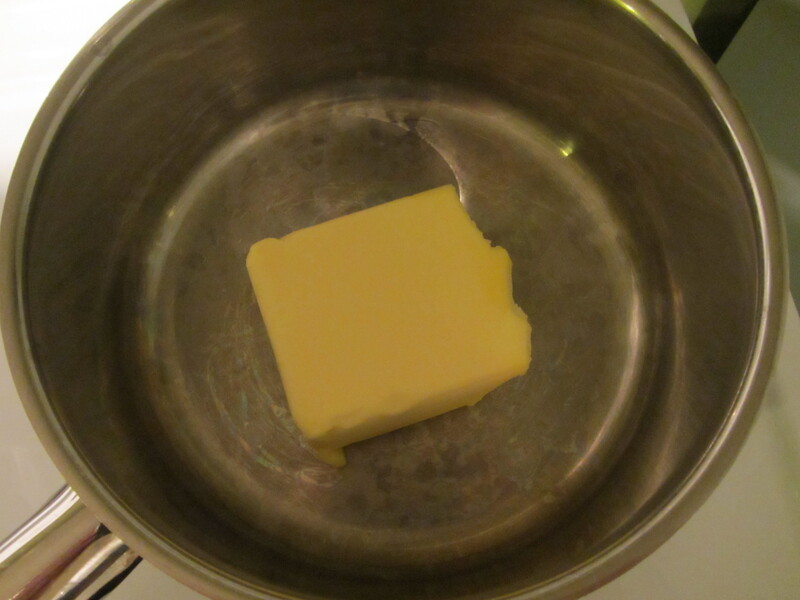 Once your butter is clarified and strained, you heat some of the butter in a pan over high heat. 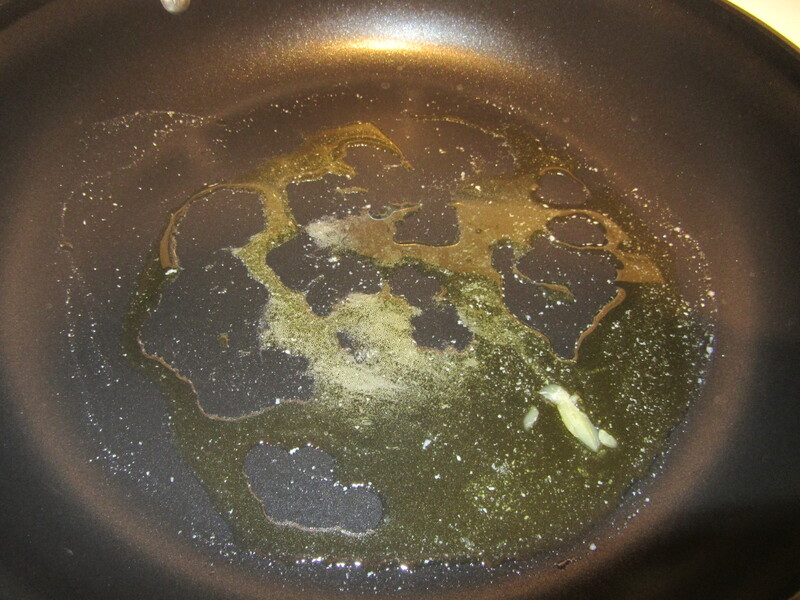 The high heat is why it is necessary to clarify the butter in the first place, as clarified butter has a higher smoke point than standard butter. To your butter, you want to add your sliced mushrooms, handful by handful. First handful of mushrooms in the hot pan. 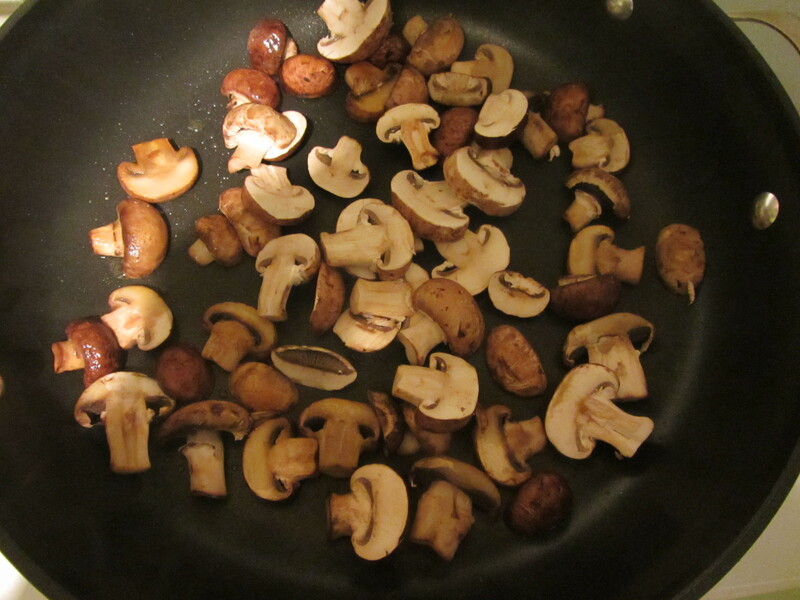 As each handful of mushrooms browns, you move them to the outside of the pan while adding new mushrooms to the center of the pan. Adding mushrooms, handful by handful. 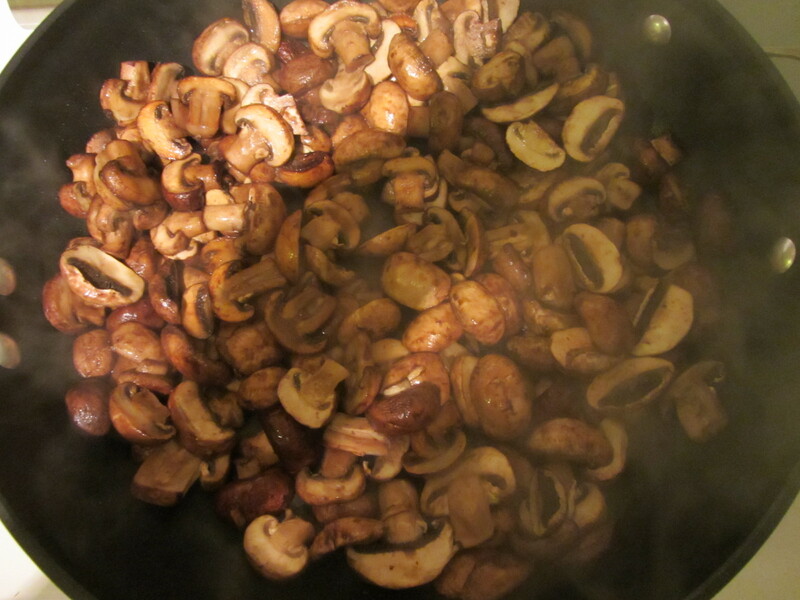 Once all of the mushrooms are in the pan, you add Kosher salt and shallots. 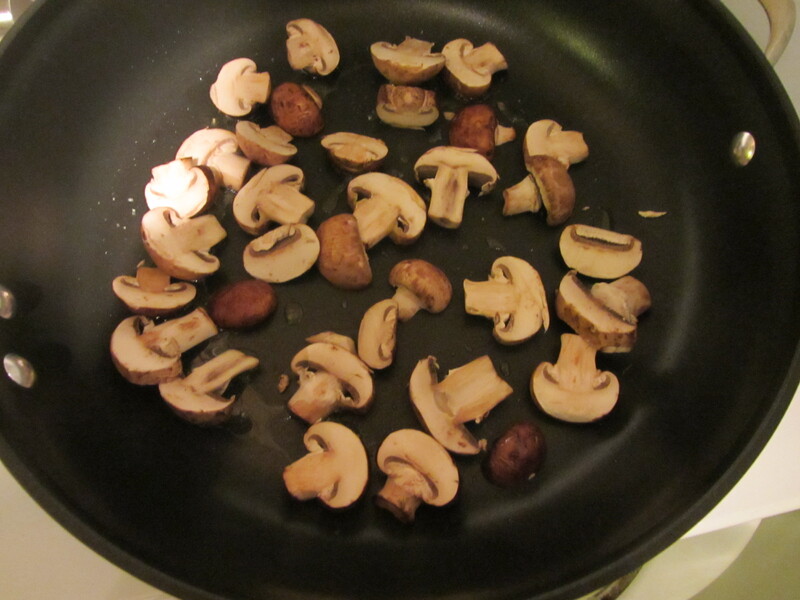 You continue to cook the mushrooms until they are all a rich brown color and a crust has formed on the pan. At this point, it is necessary to deglaze the pan, and Cognac is the liquid of choice. 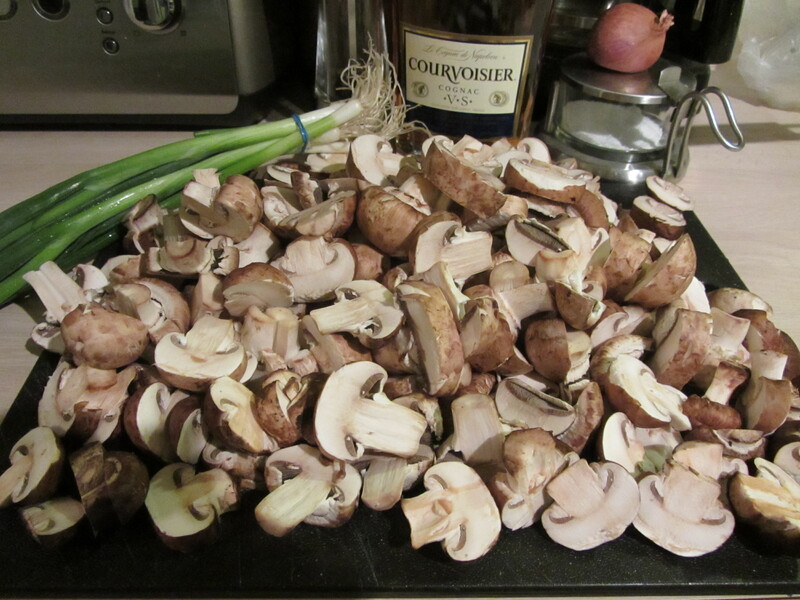 Mushrooms with shallots and Cognac. 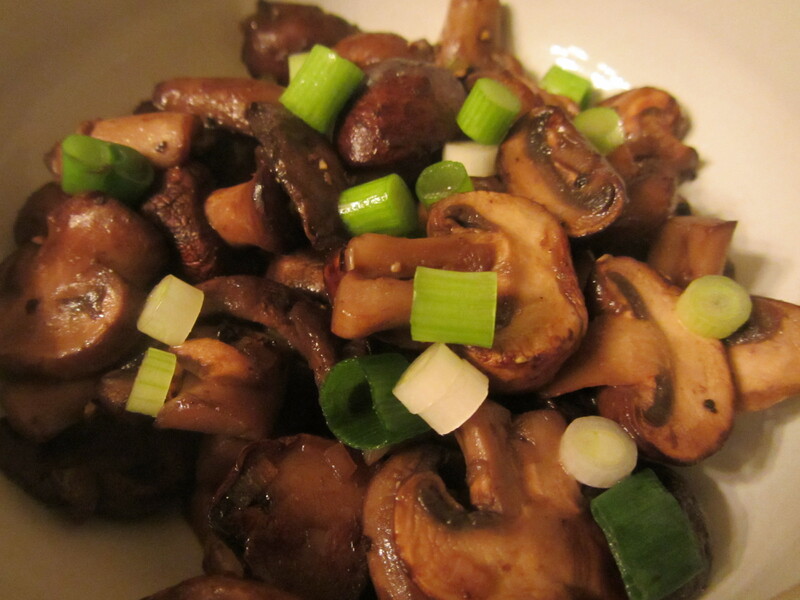 You add some chopped chives to your mushrooms, along with some pepper, and you are ready to go. 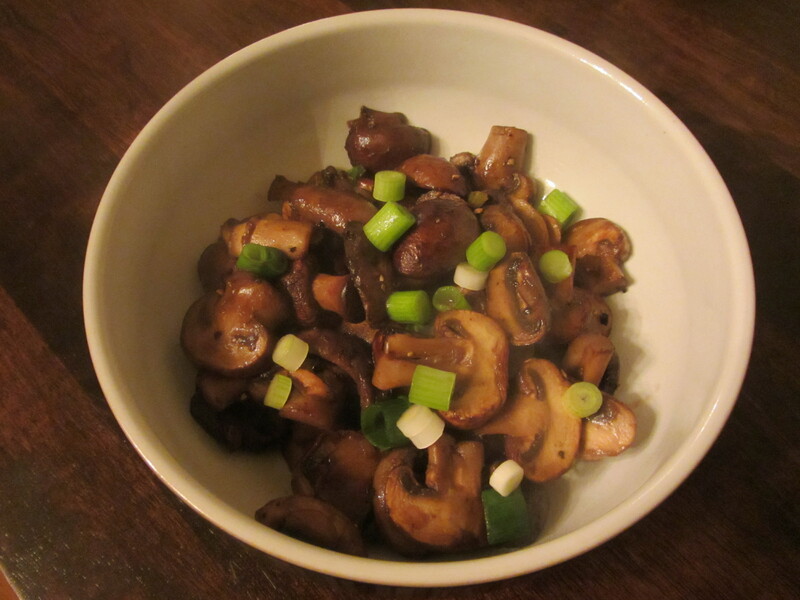 Final sauteed mushrooms with chives. We ate our mushrooms as a side to our entree. The nice thing about this sauteed mushroom recipe is that it really allows the meaty flavor of the mushrooms themselves to shine. While I still like my old sauteed mushroom recipe too, I do think that the old recipe had some strong flavors (garlic, lemon, etc.) that overpowered the mushrooms. 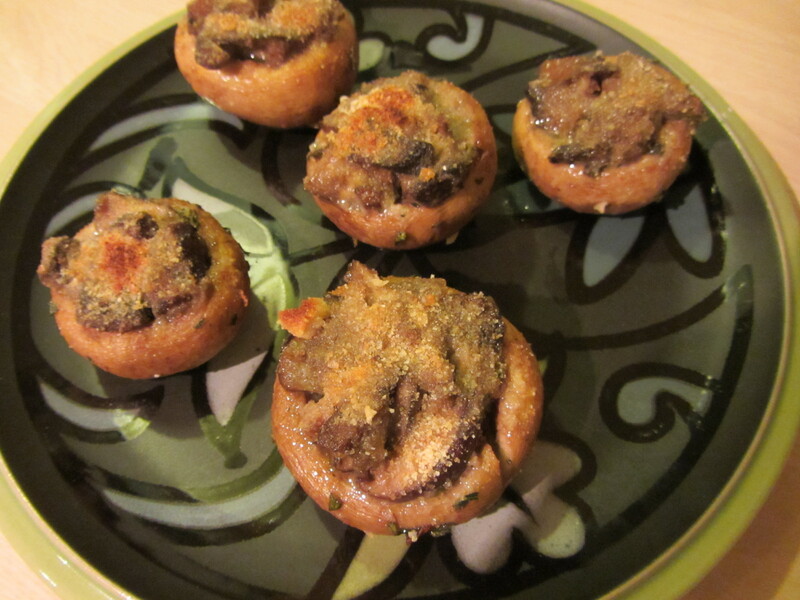 This recipe didn’t wow me, but it was good, and the predominant flavor was definitely that of the mushrooms. The second recipe in this episode of Good Eats is for stuffed mushroom caps. 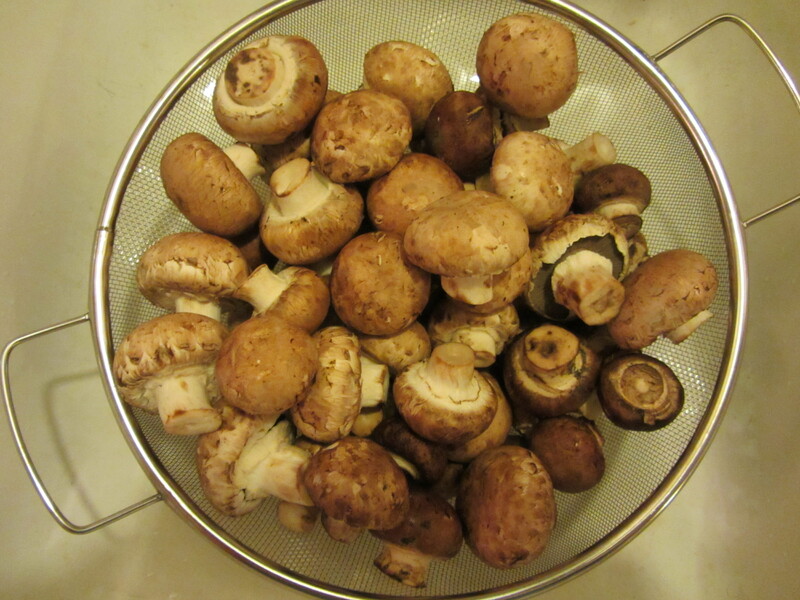 The online recipe is a bit vague with its ingredients, as it calls for a batch of sauteed mushrooms. After watching the episode, I got a bit more clarification. 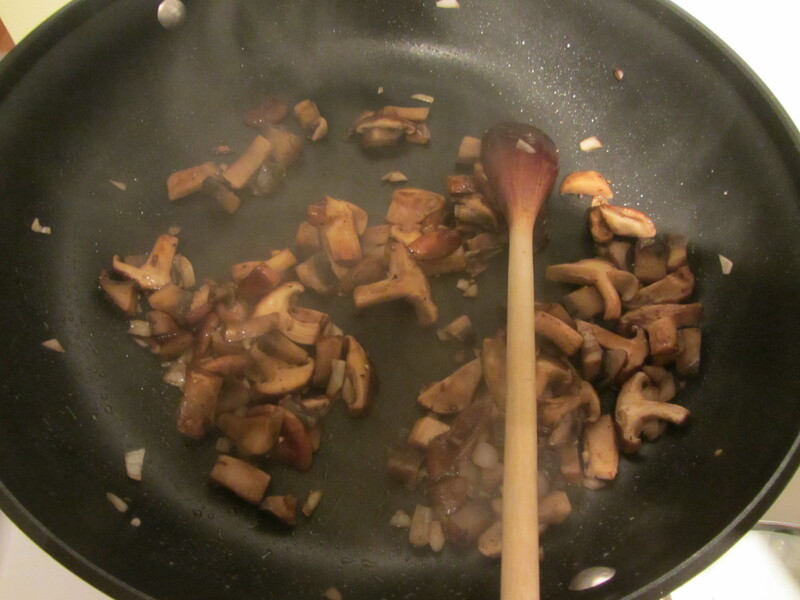 Alton tells you to prepare a batch of sauteed mushrooms, using the same method as used in the previous recipe. 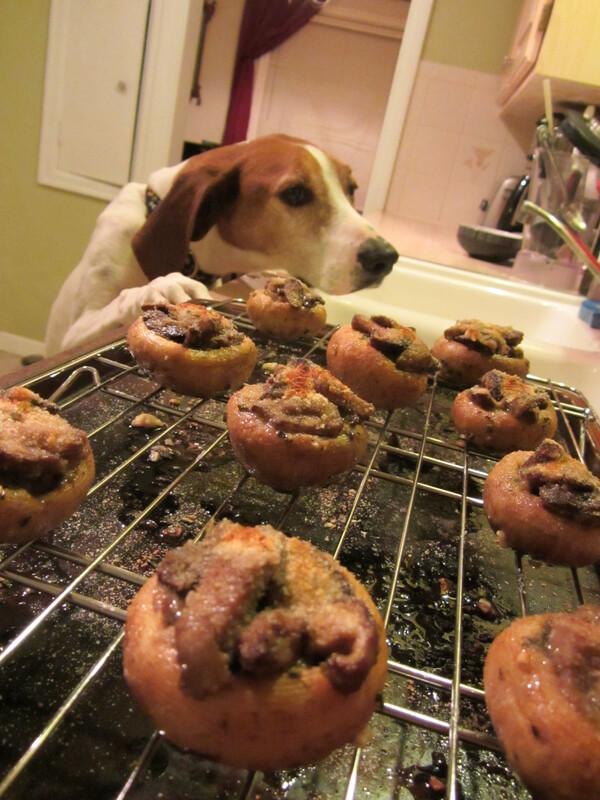 This time, however, he recommends that you use shiitake mushrooms. My grocery store only had one package of shiitakes, so I used those plus a portobello mushroom cap. 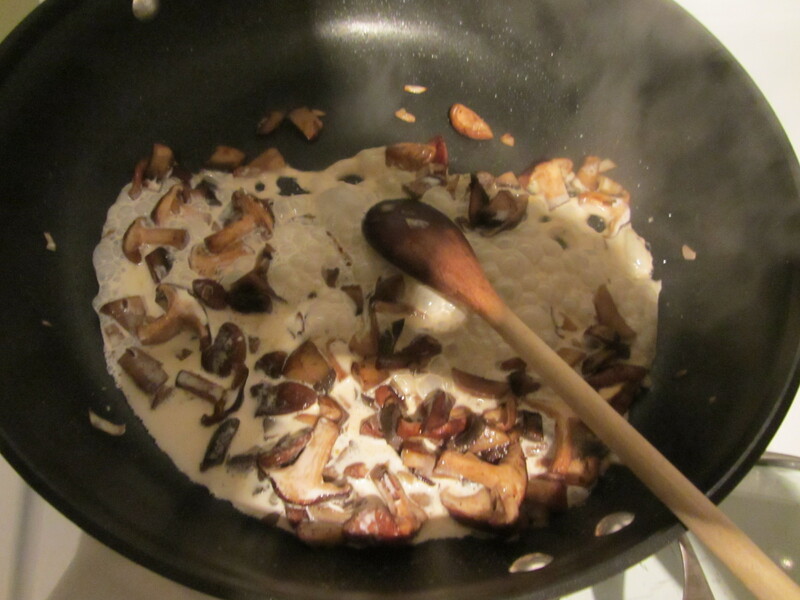 To the sauteed mushrooms, as prepped previously, you add heavy cream, shredded parmesan, and dried tarragon. Addition of cream, parmesan, and tarragon. At this point, you remove your pan from the heat and add some breadcrumbs. The breadcrumbs nicely bind the sauce. This mushroom mixture will be the filling for white mushroom caps. Breadcrumbs added off heat to tighten the sauce. After destemming the mushroom caps, you sprinkle them with olive oil, rosemary, thyme, and garlic, tossing to coat them well. Mushroom caps tossed with olive oil, rosemary, thyme, and garlic. These caps go into a hot oven until they are tender. It is best to cook them upside down on a cooling rack that is placed on a baking sheet, as this allows all of the juices to drain. I actually forgot to bake my caps upside down, so their cavities were filled with liquid that I had to drain out. 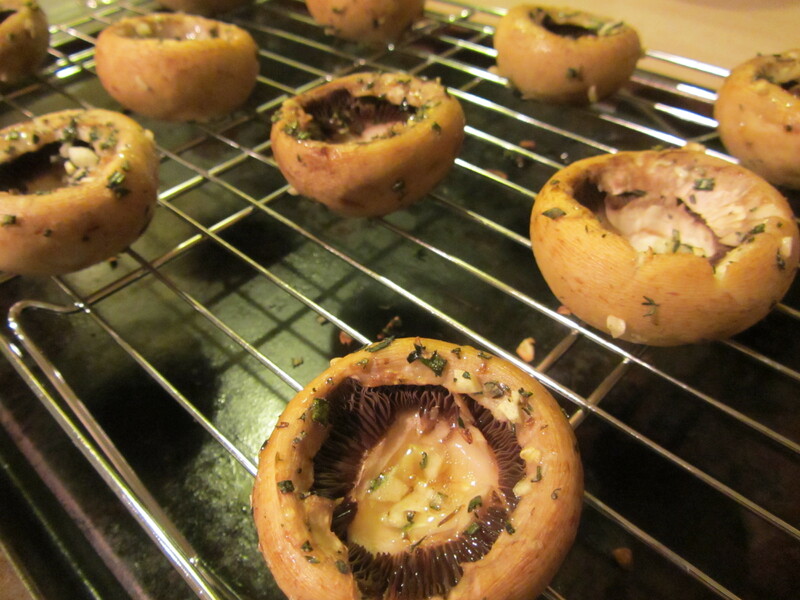 Mushrooms ready to go in the oven. 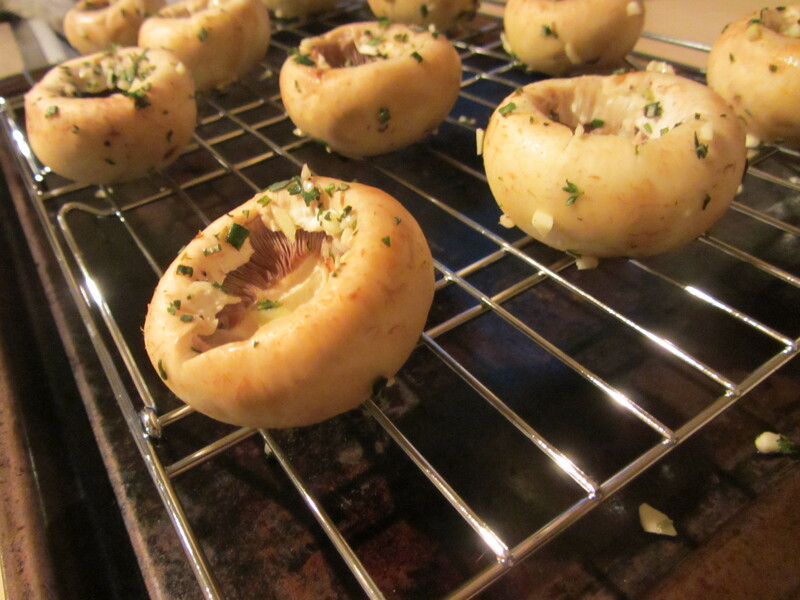 Mushrooms after baking. I forgot to turn mine upside down before I baked them, so they filled with fluid. 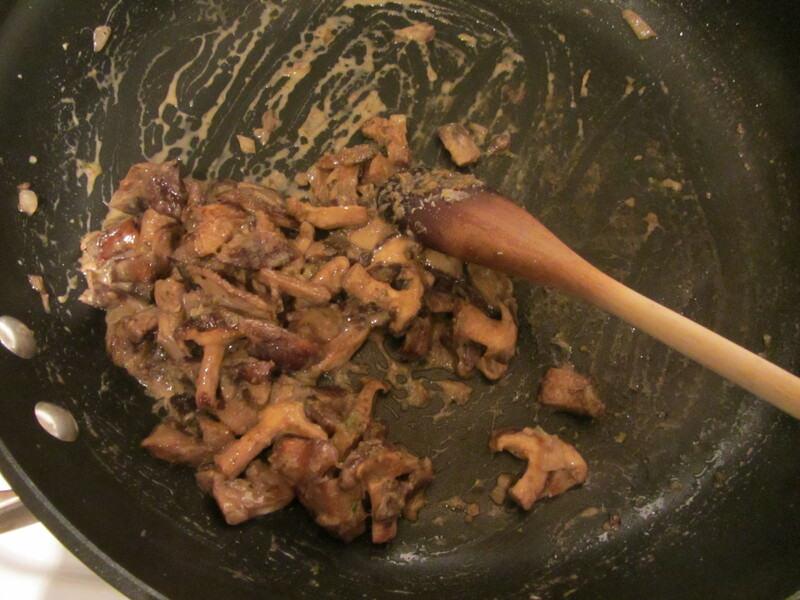 The sauteed mushroom filling is spooned into the seasoned caps, and Alton stresses not to overstuff them. The filling is topped with a sprinkle of breadcrumbs, and they go under the broiler on the highest rack. Some breadcrumbs sprinkled on top. 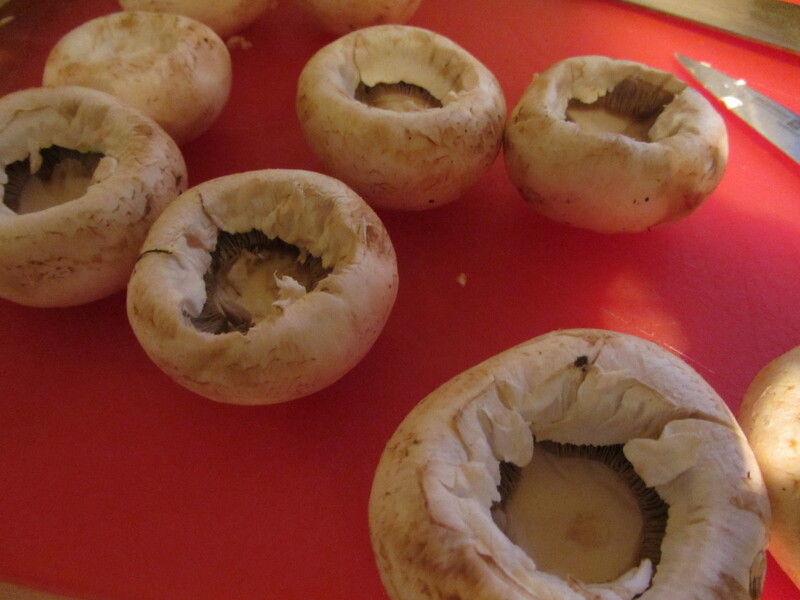 The mushrooms will not need to be under the broiler long – mine took only about two minutes until the filling began to bubble. I guess the mushrooms smelled good when they came out of the oven. A perfect appetizer plate of stuffed mushroom caps. We ate these mushroom caps as an appetizer, and we both really liked them. They were quite juicy and the filling had rich, creamy flavors and textures that paired well with the meatiness of the mushroom caps. 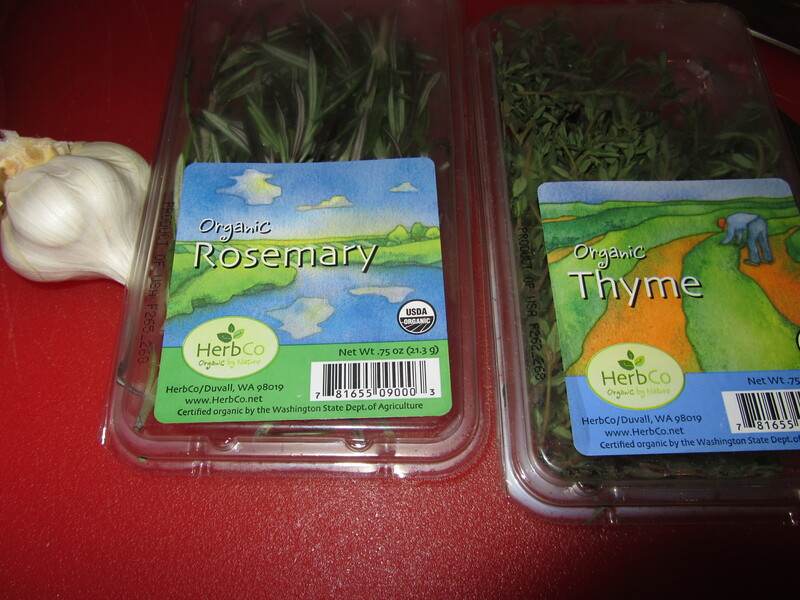 The flavors of the different mushroom types all came through too, as did the herbs. 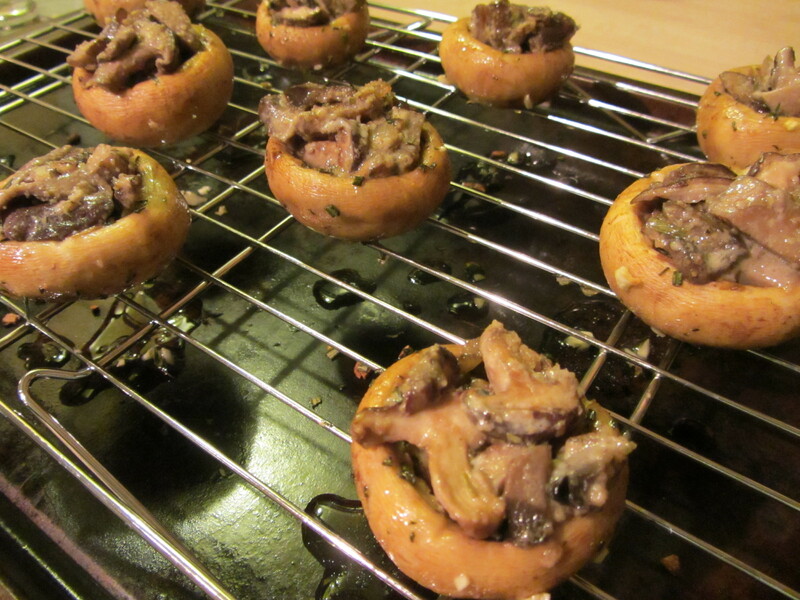 I preferred this recipe to the sauteed mushroom recipe, and I could see making these again as an appetizer.